Andy Martin will tell you that Oregon’s South Coast is home to some of the best fishing in the West. The Brookings native started Wild Rivers Fishing ten years ago to share his passion for Oregon’s wild rivers, gorgeous coastlines and remote canyons. In wintertime, Andy guides fishing trips on the Chetco, Elk and Sixes rivers as well as the Coquille and Umpqua rivers. We asked Andy to talk about the unique experience of winter fishing on the Oregon Coast. What makes winter fishing in Oregon special? 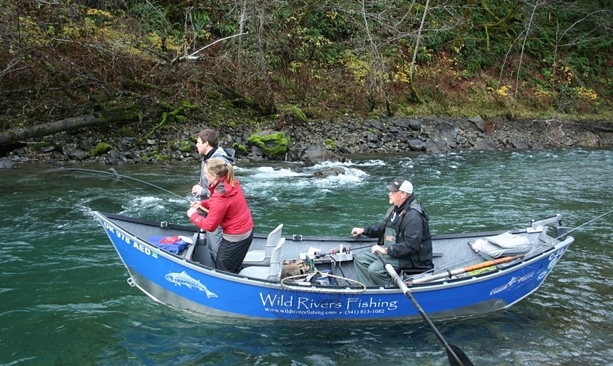 Oregon’s best river fishing takes place in the winter. It’s the best time of year to catch trophy-size salmon and steelhead. The Coast also has mild weather in winter, so even though it’s wet, it’s often much warmer than other areas of the state. 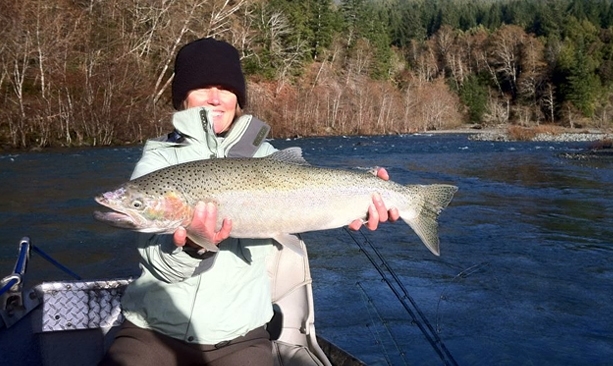 Winter-run steelhead are the main attraction because of their size and extremely hard fight. They average 8 to 12 pounds, but fish as big as 20 pounds are caught each year. King salmon season runs through December, and they can sometimes top 50 pounds. What do you love most about this season in Oregon? These fish don’t enter Oregon coastal rivers until late fall and winter. They can’t get upriver until we get heavy rain. During the winter we fish from drift boats, so along with world-class fishing, people get to enjoy floats down some of the most scenic rivers anywhere. Many people who visit in summer don’t realize that the no-hurry pace here during the winter makes it a great time to visit. What do visitors enjoy most about winter fishing? People come to the South Coast to get away from the crowds and catch big fish on scenic, forested rivers. 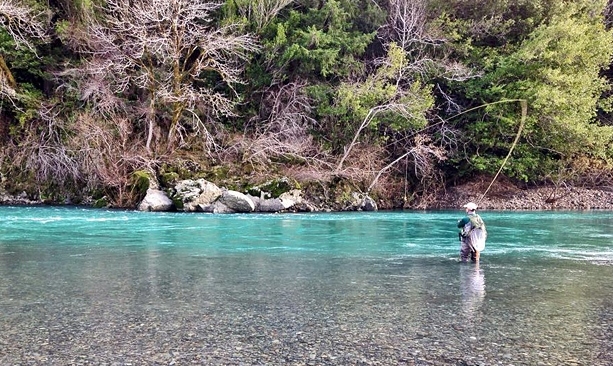 The Chetco is one of the most beautiful rivers anywhere, and the fish are plentiful and big. Hooking a large fish is a big draw, but floating down a remote river in rural Oregon is also an unforgettable experience. What’s the view from the boat like on typical day out? The rivers we fish all originate deep in wilderness areas and national forest lands. They are fast, free-flowing waters that wind through steep canyons into coastal valleys. Big trees hang over the river and clean gravel bars line the shore. These rivers look the same today as they did hundreds of years ago. Why is Brookings such a draw for anglers? Besides being located near the Chetco, Smith and Rogue rivers, there’s great ocean fishing out of the Port of Brookings Harbor. Brookings has some of the nicest weather on the Oregon Coast, too. For more information about fishing with Andy, visit WildRiversFishing.com. For more fishing inspiration, consider a trip Chasing Winter Steelhead.